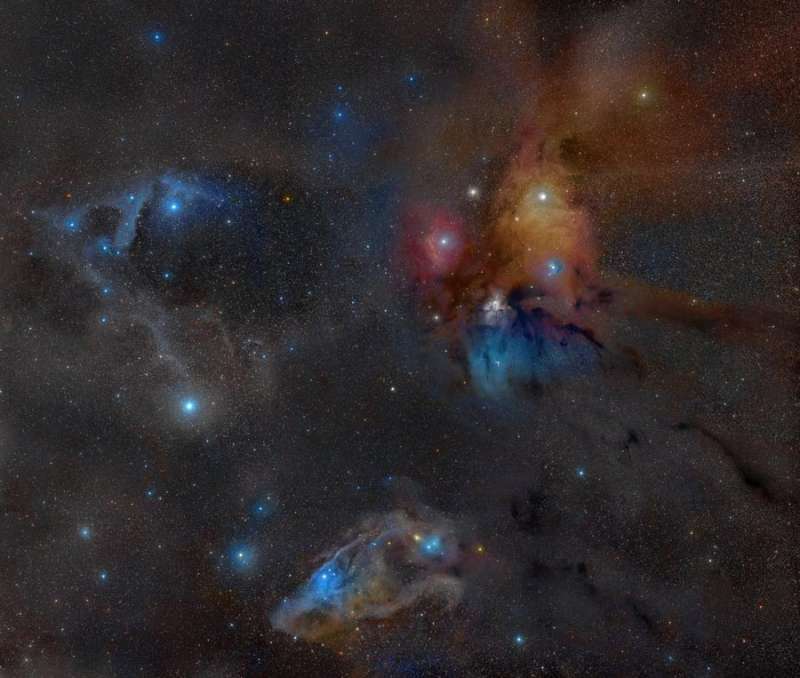 Explanation: The clouds surrounding the star system Rho Ophiucus compose one of the closest star forming regions. Rho Ophiucus itself is a binary star system visible in the light-colored region on the image right. The star system, located only 400 light years away, is distinguished by its colorful surroundings, which include a red emission nebula and numerous light and dark brown dust lanes. Near the upper right of the Rho Ophiucus molecular cloud system is the yellow star Antares, while a distant but coincidently-superposed globular cluster of stars, M4, is visible between Antares and the red emission nebula. Near the image bottom lies IC 4592, the Blue Horsehead nebula. The blue glow that surrounds the Blue Horsehead's eye -- and other stars around the image -- is a reflection nebula composed of fine dust. On the above image left is a geometrically angled reflection nebula cataloged as Sharpless 1. Here, the bright star near the dust vortex creates the light of surrounding reflection nebula. Although most of these features are visible through a small telescope pointed toward the constellations of Ophiucus, Scorpius, and Sagittarius, the only way to see the intricate details of the dust swirls, as featured above, is to use a long exposure camera.